Acetrikes industrials Co., Ltd. Head office located in Chang Hua Taiwan, The founder and the president Mr. Wu Yao Ming established company in 1975, we have been producing many kind and sizes bicycles, such as tricycle, BMX/FS and adult derailleur bikes ( Road bike, MTB, ATB, City bike ) for 35 years and also producing the electric bicycles and scooters for many years, Acebikes group owned the affiliated companies including JCE-JCB electrical Technology Co., Ltd, Jian Tai bicycle parts Co., Ltd, Jia Cheng carton Co., Ltd and Yu Shun bicycle frame manufactured Co., Ltd.
After over 30 years development, we have owned numerous equipments for bicycle manufacturing, including ERP system arranged production and the complete set of standard of quality control, Acebikes bicycles ( Taicang ) factory had been certified with ISO9001 2000 IQNet & QMI、CQC and have obtained the World Mfg Code WMI L4L. Now we have implementing the TPS (Toyota Production System) an advanced management system to our internal managing system, so it can have more and more rational and standard management. 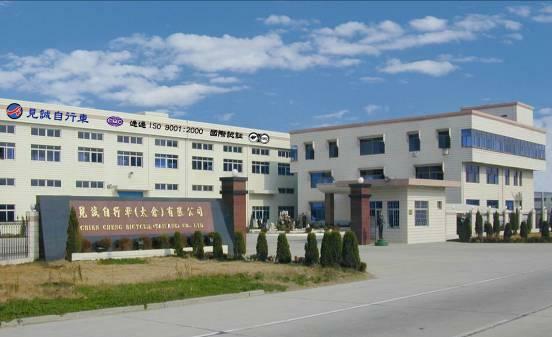 At Taicang, now we own two frame manufacturing factories which can make various high-end and high quality steel, Cr-mo, alloy frames, forks and other components as well, including the wheel assembling line, and two painting facilities, we have six assembling lines and with over 800 skilled workers and 80 office staffs at Taicang factory. We have qualified QC team and a great diversity of inspection facilities at ACE that can carry out various tests for bicycles and electric bicycles to guarantee the quality of our products. we bought an EN test machine for frames, fork and many different parts Testing to meet EN standard and satisfying customer’s needs. We also have PLI (Product Liability Insurance) to cover US$2,000,000 availability for all our bicycles products. We have cooperated with many well-known customers all over the world, we have yearly production capacity is 2,000,000 units and as usual we had production around 1,500,000 units a year, we are not satisfied with the current achievement, we do constantly make our most endeavors to enhancing for product quality and focus on new products research and development , we’re sure to match up with the world tendency of bicycle industries. The above brief instruction would help you have further understanding of our company in all aspects, and we appreciate for your any valuable comments.